RSFeedback! is a Joomla! feedback component that gives your users the opportunity to express their suggestion and ideas. In this episode, we will present the most important RSFeedback! backend features. This tab lists all users submitted suggestions and ideas. Admins can edit the feedbacks, change the status and category, manage votes and flags. Old feedbacks can be archived / unarchived. Here you can configure the feedback categories: the maximum number of votes per feedbacks, allow or disable anonymous voting or feedbacks. Admins can create their own custom groups or use the existing ones. You can create your own custom statuses according to your needs or use the pre-defined: accepted, declined or completed. Users can use flags to mark feedbacks as spam, duplicate, wrong category, inappropriate or any other custom flag created by admins. Admins can create moderation rules that will automatically delete, archive, unpublish, according with the triggered flag. 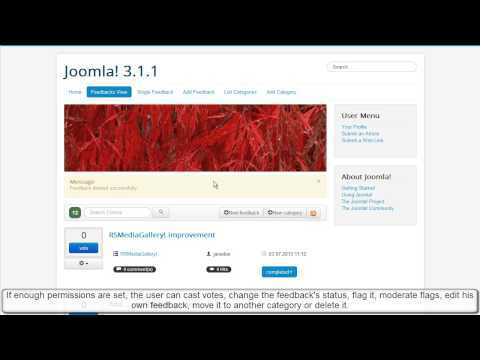 Users can discuss about their ideas using the built-in comment system or, if it exists, the already installed Joomla! comment. Here you can set the RSFeedback! global configuration: the allowed number of votes per feedback and per user, select the comment system, enable/disable anonymous feedbacks and votes, captcha and the pop-up window from the left/right side of your Joomla! website.